If you’re dealing with hair loss or thinning hair, the odds are that you want to know what solutions are out there for you. There is a lot of information about procedures, medications and other types of treatment. You want the best and most up to date information about all of your hair loss treatment options and RHRLI would like to help. Our experienced physician and his team use advanced technology to put together a hair restoration plan that suits your needs. The most common type of hair loss is a hereditary condition that usually follows a pattern. 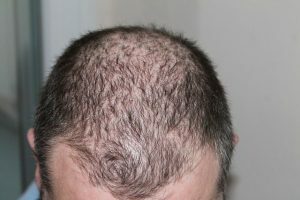 Men will usually see a receding hairline, as well as thinning on the back of the head. Women are more likely to see thinning hair across the scalp. According to the National Library of Medicine, the tiny holes in the skin of your head called follicles begin to shrink over time, causing shorter and finer hair to grow until eventually, it stops altogether. Less frequent causes of hair loss include skin infections, hormonal changes, autoimmune disorders, reactions to medication and even emotional stress. You’ve probably heard of prescription or over the counter solutions to thinning hair. Drugs containing minoxidil, like Rogaine, have received much publicity but they don’t provide a permanent solution to thinning hair. Minoxidil is applied directly to the scalp once or twice a day. It only works if the drug makes direct contact with the scalp and it will stop working once you stop taking the drug. Robotic Hair Restoration specializes in a procedure called Robotic Follicular Unit Extraction (RFUE) that will be a lasting solution to your hair loss. Let’s examine how RFUE differs from other surgical and mechanical treatments you may have heard about. Traditional hair transplants like Follicular Unit Transplantation (FUT), often called “strip surgery,” involves removing a strip of scalp tissue from the donor area. It requires using sutures to close the area where the donor hair is removed. Pain medication must be given, which lengthens recovery time. Our RFUE procedure starts with a consultation and a scalp examination. We will seek out healthy donor hairs, usually found at the back of the head that are suitable for transplant and move them to areas which are thinning. The procedure is minimally invasive and very precise because the robotic system cuts down on human error. There is no pain and a fast recovery process of just a few days. Most patients are back to work within days rather than weeks of the procedure. There is another follicular unit extraction (FUE) techniques that exist, but these are not as advanced as the a href=”https://www.rhrli.com/artas/artas-vs-other-systems/” target=”_blank” rel=”noopener”>ARTAS® System used exclusively by Robotic Hair Restoration of Long Island. Non-robotic FUE procedures usually use hand-held devices that don’t have the reproducible precision that RFUE has. Our robotic system is far more accurate and will give you the highest quality hair transplant procedure possible. Another benefit you need to consider is convenience. Robotic Hair Restoration of Long Island is the only hair treatment center in the area that has the ARTAS® system. You won’t find it anywhere else in Nassau and Suffolk County or in Queens and Brooklyn. Why go into Manhattan and pay more? Contact us at (516) 605-1545 or fill out our form to get started.